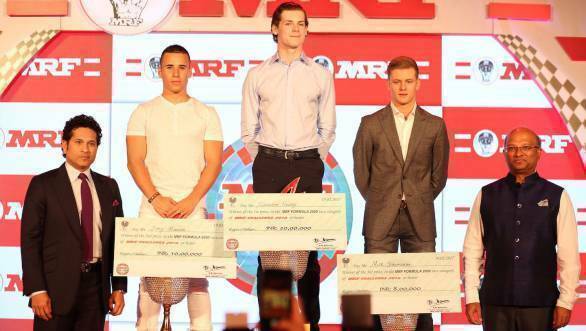 The MRF Challenge came to a close yesterday, with Sachin Tendulkar giving trophies away to the top three drivers in the championship. The Indian cricketing legend handed championship winner Harrison Newey the trophy for winning the championship. Runner-up Joey Mawson was, who had tied for points with Newey, but ceded the title because he had fewer wins, also received his trophy from Tendulkar. As did Mick Schumacher, the son of F1's seven-time world champion Michael Schumacher. Speaking of his championship win, Harrison Newey said, "It is an incredible feeling to win the MRF Challenge, especially on the last lap of the final race. At the start of the season my aim was to win the title so it feels good to achieve that. The field has been very competitive and I have had to work really hard to win the title. Overall the MRF Challenge has been a good learning for me and I hope tocontinue this form going into the rest of the year." Mawson, who was disappointed that he lost the title said that he was happy with the overall experience he got in the series. He declared that while Newey and Schumacher had been fast all season, he had also managed to stay consistent himself. Meanwhile, Mick Schumacher, who will begin his Formula 3 campaign in a few months' time stated that he had a really good season and continued to say that, "The racing overall has been great, especially with Harrison and Joey." He went on to say that it was a big honour to be able to meet Sachin Tendulkar.